Revolt of 1857, which led to the removal of British Company Rule in India, is the display of utter hatred and anger in Indians towards the Foreign Rule. It was the most severe outburst of anger and discontentment accumulated in the hearts of the various sections of the Indian society ever since the inception of the British rule. As Jawahar Lal Nehru in his famous book, Discovery of India has written, “The very fact that a country with such a great illustrious past, should be ruled over by a handful of people from a distant island is something that makes me wild” clearly shows the resentment of the people and basically showcased their inner feeling about the entire rule. [highlight]British historians called it a “Sepoy Mutiny” and the Indian historians called it “The First war of Independence”[/highlight]. We have seen various debates now and then where people talk about the name that the Revolt of 1857 deserves due to its various features, causes and consequences. 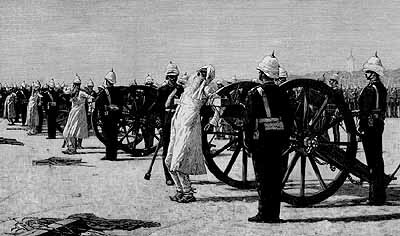 There were varied views on whether to call this outburst as a sepoy mutiny, national struggle or a manifestation of feudal reaction. I feel both the titles for this Revolt of 1857 are apt and can be used so as to describe this revolt. But taking in consideration both the point of views, I would say that both titles are apt and can be used so as to describe this revolt. Because of the entire act done by one soldier, Mangal Pandey, the soldiers initiated the cause as it was a grave mistake for them to hurt their religious sentiments. So, they took off this fight and ignited this flame which shifted its focus from greased cartridges to oppression of the British. But it acted as a First war of Independence when other people like peasants, kings and queens started taking part in the revolt so as to show their anger and to fight against the suppression. Several Revolts took place like the one at Jhansi (June, 1857), Battle of Badle ki Serai in Delhi (June, 1857), Massacre at Satichaura Ghat, Kanpur (June, 1857), Bibighar Massacre, Kanpur (July, 1857), Battle of Betwa (April, 1858), Battle of Banda( April, 1858) and many more. This revolt witnessed the defeats of many rulers like Tatya Tope, Rani Lakshmi Bai, Bahadur Shah Zafar and many places were captured by British like Jhansi Fort, Gwalior Fort etc. This entire rage which somehow marked the beginning of the struggle for the next 90 years for complete independence is correctly called as The First war of Independence. So basically one set of event which led to the entire revolt cannot escape both the title and justifying one would be somehow unjust according to me. This revolt was the one which resulted in uprooting the rule of East India Company from India and the control of Indian administration was passed on to the British crown by the Government of India Act, 1858. The revolt was feudal in character carrying with it some nationalist elements. The army was carefully reorganized to prevent the recurrence of such an event. This Revolt played an important role in Anglo-Indian History. The British afterward became cautious and defensive while many Indians remained bitter and didn’t trust the rulers as well as the British again leading to such a struggle which led to the emergence of Indian National Congress. So in conclusion, I say that both the labels so awarded to Revolt of 1857 are true and correct in their own sense and I support both of them. K. Natwar Singh (2004-08-23). “Marx, Nehru and Savarkar on 1857”. Asian Age. Retrieved 2008-03-10. Inder Malhotra. “The First War of Independence”. Asian Age. Retrieved 2008-03-10.